From Alghero or Sassari drive along the SS55bis and follow signs for “Capo Caccia”. Reach the promontory at at kilometer 10.5 bear off right down a “panoramic” variant for about 200m to reach the carpark for the viewpoint onto the Foradada Island. From the car-park head south along a small path which coasts along the high sea-cliffs. There are no marking along this path but, in doubt, follow the most obvious tracks to coast along the cliff and head towards a little cave which can be seen from the car-park (see picture). Walk past this cave and continue for a further 50m to reach, on the right, a sign with the word “start” and the possibility to climb over the top of the cliff down onto a comfortable ledge (20 minutes). 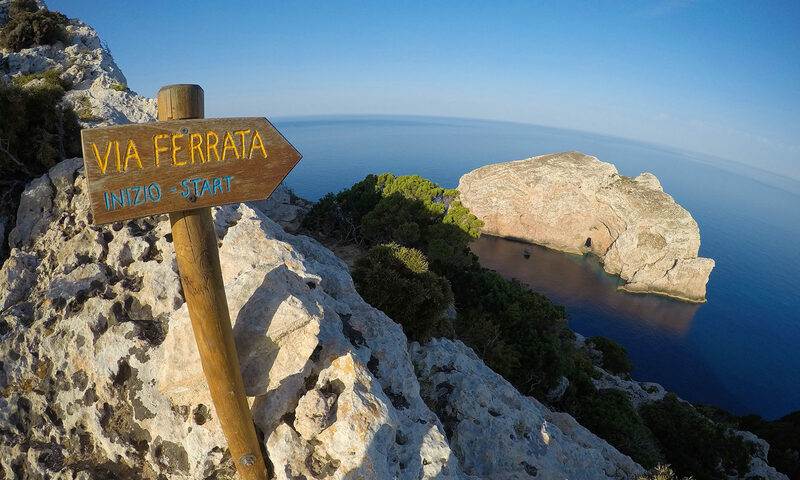 A wooden board marks the start of the “Cengia bassa”, the lower ledge, which is also the easiest section of the itinerary. The itinerary mainly develops in travers along a series of great natural ledges that, sometimes, become thin. It’s strongly suggested to climb the via ferrata starting from the lower ledge. From the wooden board a first steel cable leads down to the large ledge which is characterised first by a large landslide and then thriving sea-cliff vegetation (juniper bushes and Mediterranean scrub). Continue for circa 20 minutes without particular difficulties to reach another cable which traverses beneath the large roof which overhangs for more than 15m. After a few minutes the path leads to the only true vertical section, 25m high, this leads to the upper ledge which is decidedly less comfortable and where one really begins to feel the exposure. Follow the cable to cross a brief series of traverses and small steps to reach the “upper ledge” where the begins its return. On the right (south) it’s possible to see the long stairs named Scala del Cabirol, the only way to reach the Neptune Cave from the ground. Traverses, often across exposed terrain, are alternated by vertical sections (max 6m) in descent lead to the exit on the plateau, where a second wooden board makes the end of the ferrata. As soon as you reach the crag again you can see the car once more. To reach this return along the path used earlier in the day (15 minutes, -140m descent). N.B. There is no telephone signal throughout the via ferrata. Those who wish to climb the via ferrata in autonomy but don’t have their technical material, can be hire a complete kit. The rental cost of each kit, for a day, is 15,00 €. For hire the kit it’s necessary to reserve it, using the contact details from the page contacts. When you withdraws the kit you must fill a form where you declare that you possess the necessary skills to climb the via ferrata in autonomy and that you know how to use the kit. To pick up the kit for hire you must leave your identity card (or, otherwise, a deposit of 100 euros) which will be returned at the end of the rental. Kits for rent are verified every day, however in no event shall the hirer be liable for damages that be caused to persons or things during the excursion made without guide. The rupture or failure to return of parts of the kit will charged in equal value to the repurchase cost.